Tommy, I forgot to mention re. the "staked" aspect of the bodies: there is a school of thought that this was what inpsired the legend of the vampire. As the lady's paper on cillini has a lot of information, I forgot also to mention that people were conscious of where the bodies were interred for reasons of safety for the corpses of the souls the authorities didn't care about, in that "fresh" bodies were frequently dug up and sold on for medical research. I'm certain that the "watches" on newly-interred people which went on (remember the post on the Donegore corpse-house?) 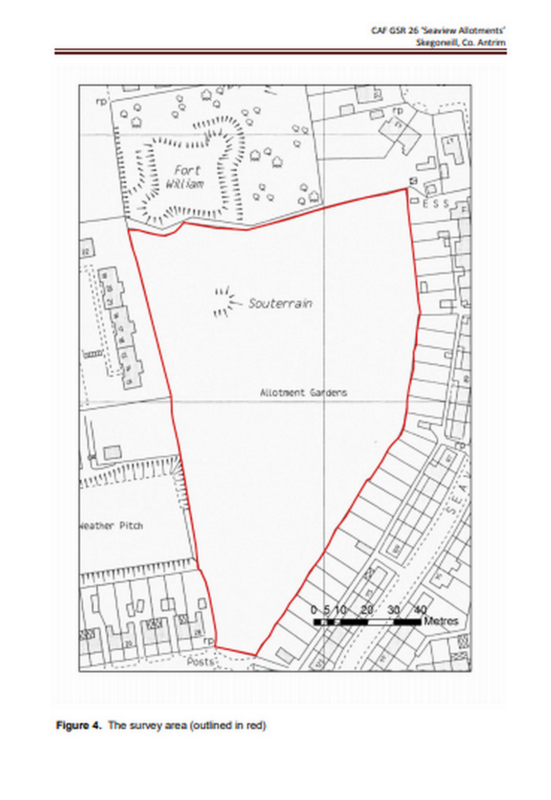 will have also been undertaken at cillini by some grieving family members concerned that their deceased relatives will have been at risk in the same way as those interred in consecrated ground. 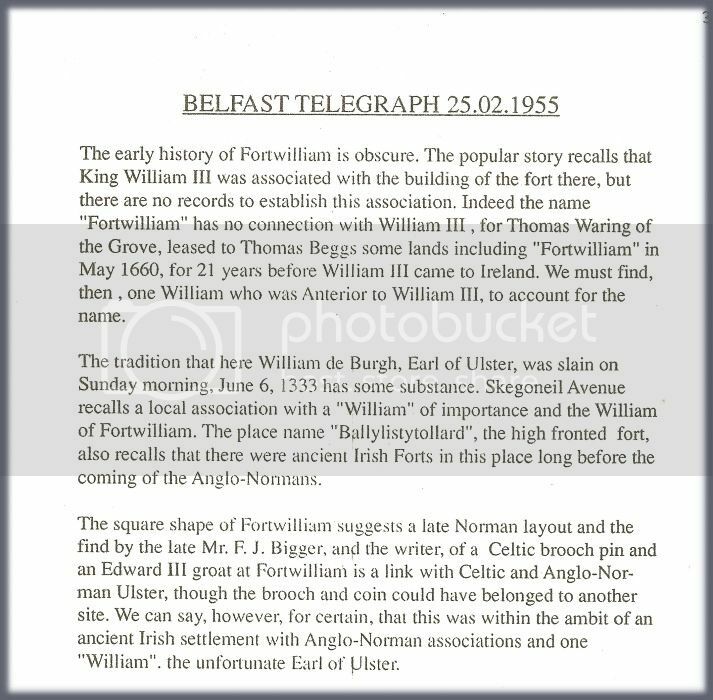 Here we are, Walter, some validation that the name "Fortwilliam" precedes King Bill. More excitingly, the find of a Celtic brooch; so there were a few "Pagans" for Ringan to try to convert. Re. the above: it should be noted that when archaeologists don't "like" certain finds appearing in places which they have decreed to be from a certain period -- in that the finds do not fit in with their theories -- the way of dealing with these rogue items is to say "they must have come in from another site." (I've a bit of personal experience of this when I found a Neolithic flint scraper from around 2,500 B.C.). I think it's the Dunlambert school fortress being spoken of here. I'm pleased that a Celtic item turned up. 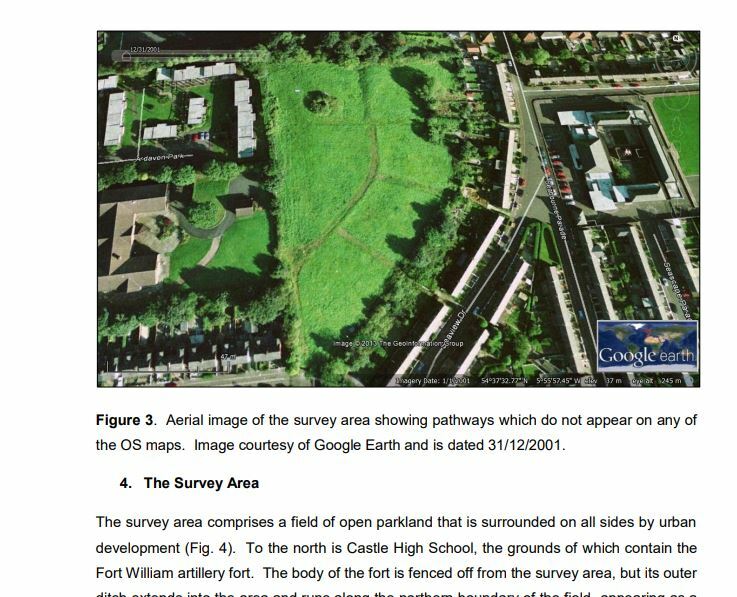 Please let us know where you heard that the lower fortress was triangular with a moat. That sounds very interesting. I know from speaking to you ages ago that you had some thoughts about this moat's location. Good to see you around again! Yesterday at half past eleven in the Donegall Arms Hotel, Greencastle, Dr. Mussen J.P. (coroner for South Antrim) held an inquiry concerning the death of DAVID NATALIA late of Heywood Street, Cheetham, Manchester, whose body was found in Shore Road under circumstance reported in our issue of yesterday. District Inspector MacGee represented the Police. Hamilton Jamieson, night porter at the Imperial and Windsor Hotel, Belfast, identified the deceased who, he believed, was a commercial traveller from Manchester. he had been staying periodically at the Hotel since witness came there two years ago. His journeys varied from four to eight days; and on the last occasion he had been here about a week. He last saw deceased about a quarter of an hour past midnight on Tuesday. He came downstairs and opened the door himself. Went out without speaking. he had seen him go out as late as an hour with other gentlemen, but never by himself. There was nothing unusual in his appearance or bearing. Thomas Armstrong, cardriver, residing in Belfast, said he drove some passengers from Belfast to Greencastle about four o'clock on the morning of Wednesday. Going along Shore Road. near Fortwilliam Park, he observed an object lying on the footpath, which he did not examine at the time, but returning he saw that it was the body of a man, and that there was a quantity of blood about. He reported the matter to a Policeman, whom he brought on the car to where the body lay. he saw the officer pick up a revolver from beside the man. Constable George craven said the matter of finding the body was reported to him by the last witness. He found the deceased lying on the left side, and there was a bullet wound in the forehead. he found the revolver produced near the right foot; five of the six chambers of the weapon were loaded, the other appeared to have been recently discharged. There were no signs of a struggle. Sergeant Williams of Chichester Road station said he received the body of the deceased in charge from the previous witness. Dr. Wilson was brought to examine the body, after which it was removed to the hotel. On searching the clothes of the deceased he found a silver watch and gold chain, a scarf pin, 9s 8(and a half)d in money, two fountain pens, tobacco and other articles. There was nothing by which to identify the body. Inside the hat rim a name had been written, but it was obliterated with ink. Dr. Wilson, York Street, said he examined the body of deceased at a quarter to six on Wednesday morning. There was a bullet wound in the centre of the forehead. The bleeding was from the nostrils, and he thought the bullet had pierced the brain. He was of the opinion that the wound was self-inflicted, and that it was the cause of death. This was all the evidence tendered on behalf of the Police. A gentleman present named Joel Morris Lissack, stated that he was a friend of the deceased and relatives. The deceased was a young man about 26 years and unmarried. When he saw the body on the previous morning there appeared to be a wound under the right ear; he thought the bullet had entered from behind and not through the forehead, as the doctor had stated. The coroner retired to inspect the body, and on his return said that Mr. Lissack was labouring under a mistake; there was only one wound- that on the forehead. What he had mistaken for another wound was congealed blood. the blood in the ear was probably caused by the bullet fracturing the base of the skull. Mr. Lissack then proceeded to make a statement. he said he belonged to London, and had been staying at the Imperial and Windsor Hotel since Monday. he and deceased had been a good deal together, and he was always in his usual good spirits. On the Tuesday night they were out and supped together. the deceased took very little drink; they had only half a glass of whisky each before retiring to bed. they sat together in the hotel from half past ten to twelve o'clock. He took deceased into his room to show him some article in which he seemed to be interested and promised to look at it by daylight in the morning. Witness asked when he was going to Manchester, and he replied that as the week was broken now he might stay another day or two, as he would probably book a few more orders. He belonged to a firm of shop-fitters and glass-case makers, which did extensive business in Belfast. He was a partner in the firm which was that of Messrs. Natalia and Sons, Manchester. Witness knew deceased left his room with the intention of going to bed. At the coroner's request witness was sworn. he then deposed that he had been staying at the Imperial and Windsor hotel since Monday evening last. On Tuesday they had supper together and deceased remained in the company of witness from half past nine to twelve o'clock. They parted to go to bed. Deceased was in his usual jovial spirits and made an appointment to see witness on the following morning. As regarded the revolver, he had always been in the habit of carrying it for years – foolishly as witness thought. There did not appear to be anything preying on the young man's mind; on the contrary he was very jolly and the life of the hotel; and was looking forward to returning home on Wednesday or Thursday evening. Mr. Lissack said that if the coroner could find it in his province to return an open verdict it would be a fit consolation to the deceased's Mother who was coming to Belfast that evening. the relatives were not professionally represented or some pertinent questions might have been put to the doctor. There was no direct evidence of suicide. The coroner said it was quite clear that the deceased died from a bullet wound, and the jury were bound to return a verdict whether the wound was inflicted homicidally, suicidally or accidentally. He thought there could only be one opinion from the evidence – namely that the wound was self-inflicted. the Jury found a verdict of suicide, but expressed no opinion as to the state of the deceased's mind, there being no evidence on the point. I think that maybe a number of items like this, or of a similar nature, could turn up from old newspapers. It seems to have been quite an eventful location, through the ages. I agree that this is quite a story. It has made me think since reading it. What on earth brought the guy up to Fortwilliam, and indeed leave the hotel in the wee hours? I do believe Jim has found another article written about the same event. I may have to write it out and type it up again, but it will be a pleasure to keep our little channel open here. My son bought me a beautiful old book on Saint Ringan which I will scan parts of and post here. All the best for now, Walter. The second article on the same event, found by Jim, is as follows. The description of the deceased's appearance is so detailed it almost seems inappropriate, but anyway, this one seems better written than the previous. (Sorry about Microsoft word presentation). You can see that a few details are at odds with the details in the first article. A discovery of a very shocking and sensational nature was made at an early hour yesterday morning near Fortwilliam Park gates on the Shore Road. A carman named Armstrong was driving along at the place indicated, when he saw what seemed to be a man lying on the footpath. He at once dismounted, and made an examination, when he was horrified to find the dead body of a young man saturated in blood. This led Armstrong to the conclusion that something serious had happened, and forthwith he drove into Belfast. Meeting Constables Craven and Rankin, of York Street Barracks, on the way, he informed them of what he had observed, and immediately they proceeded to the scene of the occurrence. On arriving they found that the man was quite dead, and that there was a bullet wound in the middle of his forehead, from which blood was still oozing, and a portion of the brains protruding. Beside the deceased was lying a six-chambered revolver. This weapon, with the exception of one chamber, which was fired, was fully loaded. The natural inference they drew from this suspicious circumstance was that in all probability the deceased had committed suicide during the night. Confirmations of this view were not wanted upon closer examination. The deceased appeared to be a young man of slight build, medium height, with very handsome countenance. He was dressed very respectably, and seemed to have occupied a good position in some business establishment. But there was nothing about his person which could be utilised in leading to his identification. In fact there was every evidence that he had carefully, in premeditation of his own destruction, removed from his clothing and other personal belongings what might afterwards reveal his identity. There was nothing, moreover, to indicate that a struggle had taken place, nor was there proof of the slightest character on which to rest a presumption that foul play had been used in putting to sudden and shocking a termination to his earthly career. The face was all besmeared with blood, as well as parts of the deceased's clothing, which were of the best description, and almost quite new. The coat and vest were black, and the trousers grey tweed. He wore a linen shirt, with cuffs and gold studs attached. The tie was striped, and of the bow style, whilst convenient to the body lay a hard, black felt hat. The deceased's hair was dark brown, the moustache a light colour, and when found by the police he was lying on his left side. Around the head was a pool of blood, which had flown profusely from the wound on the forehead. An examination of the deceased's clothing showed that he had on him a silver watch and gold chain, to which was attached a sovereign purse bearing the letters "N" and "D," the latter underneath the former, and partially obliterated. There was also found on him 10s in silver, two fountain pens, one stylographic pen, a packet of tobacco, and a piece of billiard chalk. When the occurrence was reported Sergeant Elliot, of York Road Barrack, visited the scene, but seeing that it had taken place outside the city boundary he had information conveyed to the police in Greencastle. In a short time Sergeant Williams, of Chichester Road Barrack, arrived, and with the assistance of Sergeant McHugh, had the remains removed to Mrs McGarry's public-house in Greencastle. 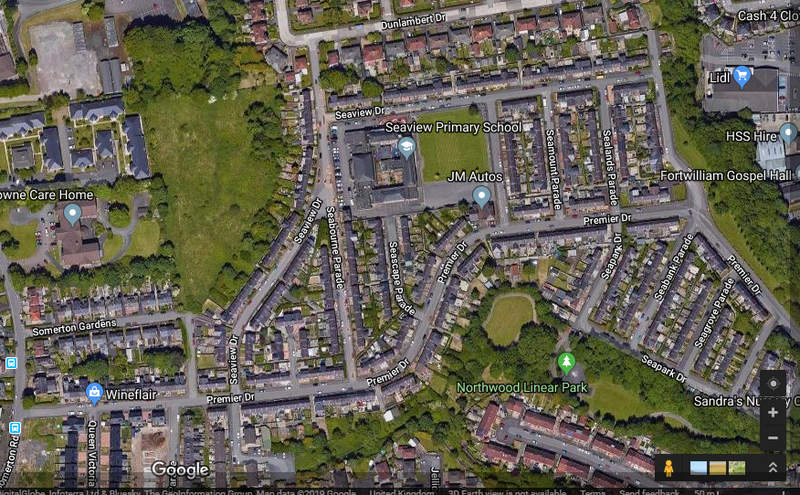 On making inquiry at Greencastle Police Barracks last night we were informed that the body had been identified as David Natali, 9 Heywood Street, Cheetham, Manchester. Constables Donnelley and Morrison further stated that the deceased had been stopping at the Imperial and Windsor Hotel, and that he was a traveller. The revolver, which was lying close to the body, was fully loaded, and one of the chambers had the appearance of having been recently discharged. The bullet was embedded in the centre of the forehead, and death must have been instantaneous, there being no signs of any struggle where the body was found. Our representative had an interview with Mr. D. C. Sutherland, assistant manager of the Imperial and Windsor Hotel, when that gentleman stated that in company with Mr. Lissack he proceeded to Greencastle about nine o'clock, and in the presence of a number of policemen identified the body as that of D. Natali, a gentleman who had been stopping at the hotel during the past ten days. Mr. Sutherland also stated that there was nothing peculiar in Natali's manner which would have led one to suspect that he premeditated an act of suicide. He was perfectly calm and collected and of sober habits. He was a frequent resident in the hotel, and had stopped there at regular intervals whilst travelling for the firm of Natali & Sons, shopfitters, Manchester. The night boots was the last person to see him alive. At twelve o'clock on Tuesday night Natali told him that he was going out for a breath of fresh air. He then left the hotel and nothing further was heard of the deceased until his body was found. His effects, when searched by the Police, did not throw any further light upon the matter beyond the fact that a box containing forty-four cartridges which originally contained fifty was discovered in his bedroom. The relatives of the deceased were apprised of the sad occurrence through telegraph. Dr. Mussen (the coroner for the district) will hold an inquest on the body to-day at half past eleven o'clock. Well, you've got to admire our Mr. Dempsey, for he had a go. He tried to get a premises up and running at Skegoneill, going to considerable expense, and when thwarted by the authorities he built a house opposite the Fortwilliam Arms at the old landmark of Ringan Point, obtained what I've heard referred to as an "outdoor beer licence" and then fought through the courts with some determination to have the scope of that licence enlarged, so as he could have his own pub on the Shore Road. He was pretty determined to set up in the environs of our old road, and here's a transcript of him arguing with the big men of the Victorian world (local to Belfast) in another litigation of 1878. Now it could be that it was the other way around: that he tried first at Fortwilliam and then later at Skegoneill, but as I can't flick back through the pages, I'll leave it up to someone to correct me if I'm wrong. It mightn't have been Mr. Dempsey either, but from memory I think it was. Interestingly, the outdoor beer licence will have been up and running perhaps on the night of Mr. Natali's death, leaving us to conclude that here was another establishment not alerted to the deceased's body lying nearby on that fateful night. Most interesting to me is that Dempsey's House must have been near Belleview Cottage, if that cottage was indeed a feature of the landscape in 1878. In the past, on Jim's thread, that fact has never been proved or dis-proved. Without further ado, here's his "spirited" attempt to establish a pub on Ringan Point in his own house which was already licensed to sell liquor to the public for carry-out. Mr James Dempsey of Belfast applied in person for a conditional order for a writ certiorari and mandamus to compel the Recorder of Belfast to grant a licence to a house built by applicant opposite the Fortwilliam Hotel, Shore Road, near Belfast. The licence had been refused on the alleged ground of the unsuitability of the premises. Mr. Dempsey, who argued the case at some length, submitted there was no evidence before the Recorder of the unsuitability of the premises, and he asked the Court to believe there was no substantial objection. Mr. Justice Fitzgerald: - " The Recorder of Belfast heard evidence as to the suitability or otherwise of the premises?"Mr. Dempsey: - " He did." Mr. Justice Fitzgerald: - " And he decided that against you. I am afraid the Court cannot assist you." Mr. Dempsey said it would be very hard if he could not get redress. He had expended a great deal of money on these premises, which was at present working on a spirit-grocer's certificate. He suggested in his affidavit that the justices before whom the matter first came were influenced. The Lord Chief Justice said the Court could not be supposed to believe that. Mr. Dempsey said the police had no ground of objection, but Mr. Rex had opposed on behalf of the Irish Temperance League. He thought the Recorder should be asked to specify the bona fide objections to the licence. The Magistrates admitted there was nothing against the personal character of the applicant, and he had carried on the business of a publican in Belfast for upwards of ten years in another house. The Chief Justice said the Court could not interfere with the decision of the learned Recorder of Belfast, unless Mr. Dempsey could point out some illegality. Mr. Dempsey said the certificate itself was not in accordance with the wording of the Act of Parliament. He had received, from a resident Magistrate and Borough Magistrate, a certificate that the premises were unsuitable.The Lord Chief Justice said, as Mr. Dempsey had failed to point out any illegality in the decision, the Court had no jurisdiction to interfere. The application for a conditioned order for Mandamus or Centiorari should, therefore, be refused. Here's a google earth image of the area, I believe the graves are in the tide area, but I've also indicated North of the Arches where others believe they are. Thanks for that, Jim, and thanks for joining in here. Sorry I didn't see this yesterday. Myself and others have speculated that there is an old ecclesiastical site at Ringan Point (based upon historical references) which previously was complete with graveyard, and that the cillin was as close as possible, and probably at the sea-wall before some or other necessity or compulsion forced the graves out further into the salt marsh. It would take an excavation at the interior of the retaining wall, perhaps somewhere near the steps that led up to the Green; but it would have to be a private matter done out of the view of everyone and everything, by persons interested in the cause, for it would be very difficult to raise enough interest in the world of academia which is rife with its biases. However, it wouldn't be impossible. I'd urge anyone interested to get permission to "hoover" around the internal base of that wall with a metal detector; or else get in stealthily, and do it where no-one can observe. I'm more interested in finding evidence of the Celts there, and Ringan himself. It's terrible to think of persons interred with so woeful a value put on their souls, but that's a matter for organised religion to deal with, and perhaps it has. Ringan interests me because the "religious" impulse in anyone who has made a name for themselves in the world of organised religion would capture my attention to a certain extent. Anyway, thanks for showing us the google map which clearly indicates "North" of the Arches. Goodness knows what secrets lie on the rising ground, and maybe some day, there'll be an initiative to find out. Townland: Skegoneill. Grid Ref: J 33650 77350. County: Antrim. Dates of Survey: 17 th - 28h June 2013. Souterrain = an underground chamber or passage,... French,... sous = under,... terre = earth. Rath = In Ireland, a strong circular earthen wall forming an enclosure and serving as a fort and residence for a tribal chief. RE,... the partially quoted post below,... this is an edited and shortened version of the quoted post below. The deceased was a young man about 26 years and unmarried. as to the state of the deceased's mind, there being no evidence on the point. There are a recent series of posts about this topic on another thread, on the post on the link below. "Anyone from the shore road area of Belfast ?."